Home ownership should be a source of pride and accomplishment, whether it is the newly-constructed home of your dreams, a quaint starter home, a suburban family bungalow, or any other type and style of private residence. And, at some point in time as a homeowner, you may be searching for a way or ways to upgrade the look and value of your home or improve upkeep efficiencies, depending perhaps on your family situation, your health, real estate values, or personal preferences/tastes. There are assuredly many avenues that you can pursue to achieve one or the other of these objectives, that is, to increase the value of your property or reduce maintenance time/costs. One option that may afford the luxury of accomplishing both goals simultaneously would be to incorporate stucco work by our experts at Canadian Stucco. Stucco work/applications by Canadian Stucco can be added to the exterior and/or interior of your home, and offer a unique combination of aesthetically-appealing accents/features with short-term and long-term cost savings in relation to energy efficiency, performance, and overall maintenance. 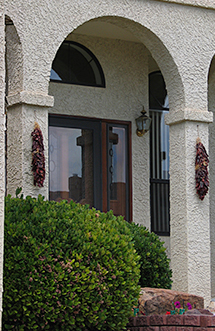 Modifying or upgrading your home with stucco will create a distinctive ambience/character that can be truly appealing and yet quite individual to your neighbourhood or community. Whether you are planning to build a new home, moving into an established home, or are in the market to upgrade your current residence, our stucco applications can increase the curb appeal of your property and simultaneously reduce energy consumption and maintenance costs. For a no-obligation consultation and estimate, call the experts at Canadian Stucco at 416-5-STUCCO or 416-578-8226 today!